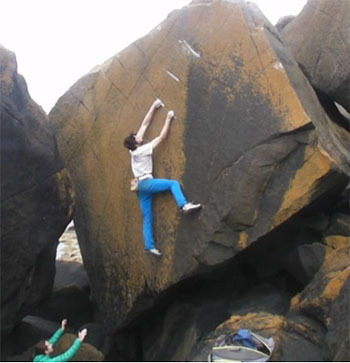 North Wales Bouldering News ::: News Details :: Piethe of Pith 7A+! Video still of Mike on Piethe of Pith 7A+! Mike Goldthorp has climbed an amazing highball line at Trwyn Talfarach. Piethe of Pith 7A+! tackles the immaculate wall left of the classic 6A, Billy Boy Arete. Piethe of Pith from Michael Goldthorp on Vimeo.